But amid protests in the Palestinian territories and uncertainty about whether the Palestinians will stay engaged in the peace effort, one US official said the process could still be disrupted. 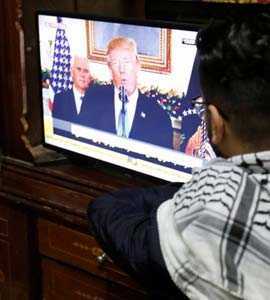 Washington: When President Donald Trump told the Palestinian president of his intention to recognise Jerusalem as Israel's capital, he assured him a peace plan being put together would please the Palestinians, officials said, an apparent effort to limit fallout over his break with longtime U.S. policy. Trump's phone call to Mahmoud Abbas on Tuesday, the day before he made his bombshell announcement on Jerusalem, appeared to shed new light on behind-the-scenes efforts by White House advisers to craft a peace blueprint expected to be rolled out in the first half of 2018 but which has now been thrown into doubt because of an angry outcry across the Middle East. With Palestinians declaring it will be difficult for the United States to act as an honest broker after essentially siding with Israel on one of the central disputes in the conflict, administration officials said they expected a "cooling-off period." Trump's team, led by his son-in-law and senior adviser, Jared Kushner, will press on with development of a plan to serve as the foundation for renewed Israeli-Palestinian negotiations, hoping the furore will blow over and that any pause in diplomatic contacts with the Palestinians will not last long, U.S. officials said. But amid protests in the Palestinian territories and uncertainty about whether the Palestinians will stay engaged in the peace effort, one U.S. official said the process could still be disrupted. "If they are still saying they're not going to talk, we're not going to do it then," the official said. Washington's major Western and Arab allies have warned that Trump's decision on Jerusalem could doom attempts to achieve what the U.S. president has called the "ultimate deal" of Israeli-Palestinian peace. Details of the negotiating framework have yet to be finalised and there is little indication of tangible progress. But officials said it would deal with all the major issues, including Jerusalem, borders, security, the future of Jewish settlements on occupied land and the fate of Palestinian refugees, and would also call for Saudi Arabia and other Gulf states to provide significant financial support to the Palestinians. In his call to Abbas on Tuesday, Trump sought to temper the blow from his Jerusalem announcement by stressing that the Palestinians stood to gain from the peace plan that Kushner and U.S. Middle East envoy Jason Greenblatt were crafting, according to two U.S. and two Palestinian officials who spoke on condition of anonymity. Trump told Abbas, a Western-backed moderate, that the final peace blueprint would offer the Palestinians an important settlement that they would be pleased with, but did not provide specifics, the sources said. Abbas told Trump in response that any peace process must result in the Palestinians having their capital in East Jerusalem, a Palestinian official said. Israel captured East Jerusalem in the 1967 Arab-Israeli war and later annexed it in a move not recognised internationally. A senior U.S. official said Trump told Abbas he wanted to discuss the issues in person and invited him to visit the White House, although the timing was unclear. Palestinians have grown increasingly concerned that any plan Trump unveils will shortchange them, a fear that deepened with Trump's formal endorsement of Jerusalem as Israel's capital, upending decades of U.S. policy that the ancient city's status must be decided in negotiations. Jerusalem is home to sites holy to Muslims, Jews and Christians. Kushner, who had no government or diplomatic experience before joining his father-in-law's White House, has mostly kept his discussions under wraps. U.S. officials say Kushner backed Trump's decision to recognise Jerusalem as Israel's capital and order the eventual relocation of the U.S. Embassy there from Tel Aviv, although he was aware of the potential for complicating his peace efforts. But one White House official said that because the peace effort had not yet led to negotiations between the two sides, Kushner's team believed the initial outcry over the Jerusalem decision could eventually be overcome. The official said the plan, which he described as comprehensive and going beyond frameworks put forth by previous U.S. administrations, would likely be unveiled before the middle of next year. A key test of keeping the peace efforts on track will be whether Abbas goes ahead with a scheduled meeting with U.S. Vice President Mike Pence when he visits the region in mid-December. A senior Palestinian official said on Thursday that Pence was "unwelcome in Palestine." Trump, the officials said, had insisted that U.S. recognition of Jerusalem as Israel's capital was not meant to prejudge the outcome of future negotiations on that issue or others between the two sides. U.S. officials acknowledged that Trump's Jerusalem moves could also put a damper on cooperation from Arab states such as Saudi Arabia, Egypt and Jordan, which the administration is trying to enlist in the peace process. They contended, however, that the broader Arab world was also concerned about keeping Trump involved in confronting Iran and fighting Islamic State militants and was therefore unlikely to remain disengaged for long from efforts to solve the Israeli-Palestinian conflict. One U.S. official said the Palestinians were in such a weak position that they would ultimately have no choice but to stay involved in U.S.-led peace efforts. Another argument that Trump's aides will likely make to Palestinians is that having granted Israel recognition of its claim to Jerusalem, the U.S. leader might now have more leverage for seeking concessions later on from Israeli Prime Minister Benjamin Netanyahu, the U.S. official said.